Niseko, somewhere I’d heard a lot about. Somewhere I was hesitant to take small children, somewhere I was glad to go to. Dispelling the myths and the hype and focusing on all the important stuff. 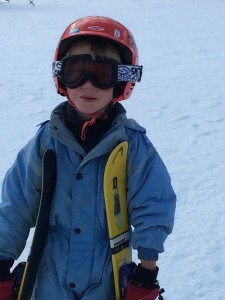 My initial thought about Niseko was that it was really too far for small children to travel. The thought crossed my mind in that zone of tiredness where you can smell murder in the air, they call ‘International Travel’. Including a 6 hour stop over from Sydney in Tokyo to catch the Tokyo- Sapporo flight, it was 22 hours of travel door to door. Resting for the 6 hours at a Tokyo hotel my parents were holed up at took the sting out of an overnight flight with a shower and a lie down. The clincher was the 2 hour shuttle bus ride to Niseko, upon arrival at Sapporo’s airport. On our return its three hours due to a large coach rather than shuttle bus. Youch. 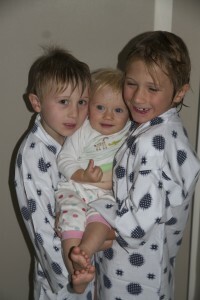 Our kids were pretty patient, considering they’re little. But it was white, white and more white out the window for them in the absence of iPad or activity book entertainment. (Yes, we live in the modern world). A very well-behaved baby made the difference between tolerable travel to Niseko and a trip that could have potentially been hell. Nothing like a few unscheduled breast feeds to get her through. Maybe it’s the knowledge that the Sochy Winter Olympics was not too far up the road, but landing in Sapporo felt more like Russia than anywhere else I’ve skied. The Tarmac, pure white was the first clue. The isolation of the surrounds and a few fur hats added to Russian feel. Our shuttle bus driver turned out to be friendly and knowledgeable Hokkaido Travel Company owner, Andrew. He happily drove 2 hours from Niseko only to turn around and drive back again. Just a casual 4 hours that day. This is from the writer’s point of view who needs three decent reasons to trek to Ikea any time of the year. Niseko is a mountain divided into 4, but I see it falling into 3 parts. Hirafu, Niseko Village and Annupuri. Hirafu, the thriving mini-metropolis ski-town surrounded (bottom to top ) by self-contained apartments, bars, restaurants, chairlifts, welcome centre and gondolas. Slopes are busy here and lift lines are long, especially on weekends. Next around the mountain is Niseko Village, which is mainly the Hilton, Green Leaf Hotel and a few scattered self-contained apartments or other accommodation set into the snow with nothing much around. Isolated, zero crowds, gondola, chairlifts and needing a shuttle bus or own transport to get to Hirafu, Annupuri is a whole other level of isolation. Approaching it on skis from the mountain, as I did, Annupuri soon became my favourite. Wide slopes, gondola and a couple of quirky food outlets, this part of the mountain is favoured by mountain workers. The part of the resort not mentioned is Hanazono, the kids ski section. With a massive food court and an activities-centric slant to the sub-resort Hanazono houses the terrain park a big favourite of our kids. I didn’t feel it was a big player in the accommodation options stake, which is why I haven’t grouped it as one of the 3, despite it being on the 4 resort pass ticket. wheat from the chaff folks, wheat from the chaff. The real bonus here at Niseko are the $50 a day tickets for adults, free tickets for 6 and under aged kids. For whipper snappers like ours, that’s awesome value. Skiing at night as well as during the day is an added allure, lightly sampled by the likes of our clan all dead to the world by 8pm. If you get a 4 resort pass (for this price) you can ski all resorts Hanazono, Hirafu, Niseko Village and Annupuri. If you’re tentative and know you’ll confine yourself to just one mountain it’s even cheaper if that’s possible. There’s no putting it kindly. You have to be SUPER KEEN to bring a young family to Niseko. Luckily – super-keen, that’s us. Accommodation falls roughly into two categories. 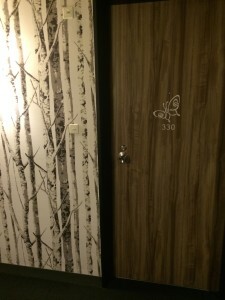 The upmarket ski-in ski-out hotels of the Hilton Hotel and the Green Leaf. Or Hirafu, the town 15 minutes down the road on the shuttle bus jam-packed with prodominantly self-contained condos and the odd hotel. As this was our first foray into the resorts of Japan WITH children we played it safe by staying two nights at the Hilton and eight nights at the Green Leaf. Breakfast included. The downside of Japanese accommodation nation-wide (it appears) is that rooms are billed per person not per room. That’s a lot of extra when you’re prepared to jam-pack 7 skiers into one single bed and eat toast with peanut butter two weeks straight just so you can ski. It’s called priorities. From the slopes this building is akin to a large donut with a bite taken out of it and a chairlift shooting out of the bite. Super-handy with the ski-in option. Hand your slippers/shoes in to the valet people, slip on boots and skis. Plenty of food options (reviewed in food section), small supermarket handy (no nappies, baby food or anything to cure a cold). Wine cheap and plentiful at $6-$8 a bottle, but I’m no French connoisseur. Or make that, I choose to drink cheaper wine if it enables me to keep skiing. Stuck indoors, this hotel is a friendly place to be. 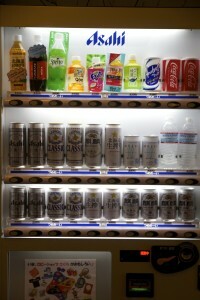 Super-sized lounge and bar area, kids tv, giftshop, kids play area, indoor and outdoor onsens, massage therapist and pub. 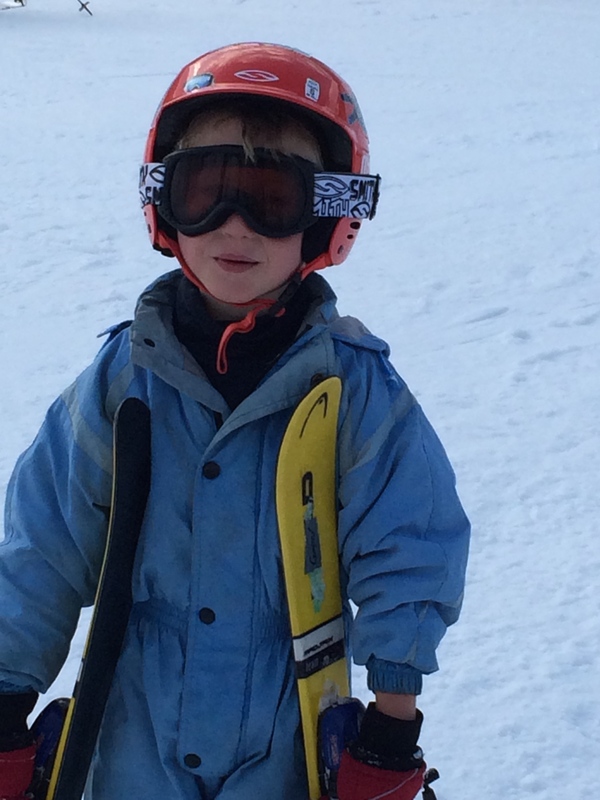 Thronging with skiers, however we felt safe enough to give the kids free-rein. Where could they really go and who was lurking out there? All rooms were key carded, they prefered to ride the lifts rather than skulk the halls anyway. The downer was a lack of interconnecting rooms, so the adults had to make like a search party and split up. Not the end of the world but highly inconvenient when you’ve thrown everyone’s luggage in together. Lots of streaking down hallways to put an outfit together. A super-sized all you can eat buffet breakfast with gorgeous scenery outside. Nobody on the slopes. It was comical. My 7 year old decided he was too scared to ride the chairlift alone and because we had 3 in the party we waited for an unsuspecting adult to co-ride. And waited. And waited. And waited. Finally, the off-season farmer (translation: liftie) called ski patrol and had someone ski down especially to ride up with him. Great lunches and buffet dinner. if you like your rotation of Japanese curries, udon noodles, katsu, chicken wings (mmmmm), all you can eat dinners you’re in the right place. 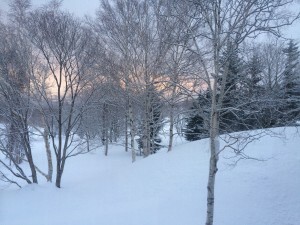 One Stop Shop – my mother came to Niseko for the change of scenery not necessarily for the skiing. The odd time she graced the slopes with her presence she only had to walk downstairs pass concierge and buy a lift pass (cheaper for one hill only) and rent skis. No flapping around the town in the wind. Or breaking your neck on icy roads. One way the kids learn to count money. Make them work for it, I say. From the outset I will claim that I’m not prone to panic when it comes to babies and their needs, unless it’s a medical emergency, in which case panic is rendered useless. However, I have hit a few walls in Niseko when it comes to baby provisions. Due to airline restrictions (Jetstar 20kg per person ) and our desire to ski on our own skis and not rentals, a few provisions got left out of the packing, thinking I could pick them up easily in a convenience store or in the hotel. In the nearby town of Kutchen a 30 minute shuttle bus ride away the Co-op supermarket was fruitful but it was a couple of days of making do. Owing to the first 2 days of an itchy head cold, I didn’t feel the love of getting on the shuttle bus so the baby was on her very last nappy and slept in a swimming nappy the night before I hit the Co-op. No nappies available here at the Green Leaf Hotel. Nor is baby food at either the Hilton’s mini-mart or the concierge. Vodka yes, chocolate plentiful but mushy vegetables- no. I’m guessing she may not be their target market. Our portable high chair, usually a whiz in a cafe won’t attach easily to the sloping undersides of the tables here. If I was Italian and prone to hysteria, I’d have ample fodder to flip out. But, we make do… And we must trek to Hirafu (rhymes). My catch ry of life is that nobody gets to ‘have it all’. We wanted cheap ski tickets, it came at the sacrifice of baby provisions. A bit like eating dehydrated food at the North Pole to get a glimpse of the Northern lights. To make a USA/ Japanese ski resort comparison, the mountain skis like Vail, Colorado but with much better snow. (our opinion only. We don’t work for the weather channel). 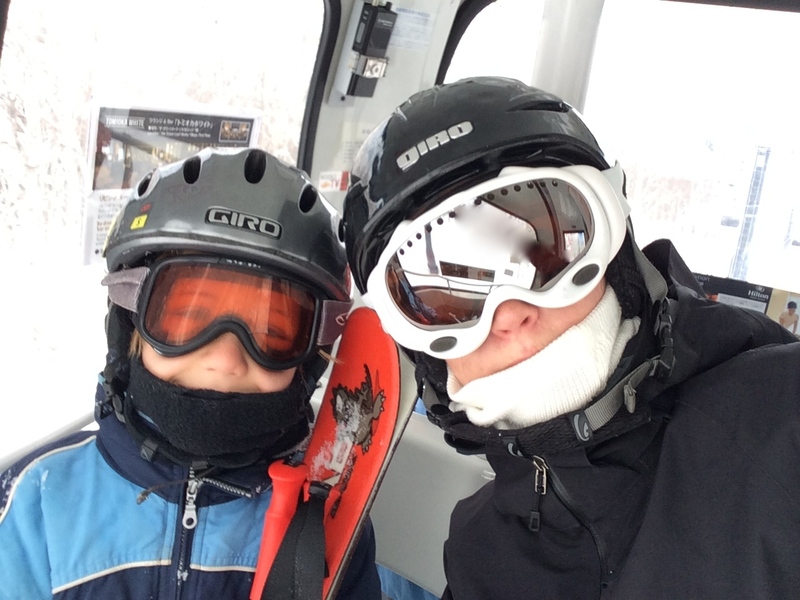 Jake found some Niseko repeat offenders who were willing to show him all their secret stashes and great slopes. There were a few opportunities for hiking up, but over on the Hirafu side they got skied out pretty quickly. Plenty of wide, uncrowded white stuff for intermediates on the Niseko Village side. Beginners struggled with anything beyond a few runs above the Green Leaf, as the gondola above the Hilton deposits skiers on slopes that depend on you having at least a little confidence getting down. If you don’t like trails (feel out of control as a beginner) you may find yourself getting vertigo on these trails. Annupuri seemed kinder in this regard, as did Hirafu if you don’t mind a more crowded slope and longer lift lines. If you came to Japan hoping to escape the cooking, you’re out of luck. 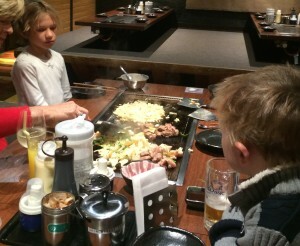 Japanese people love making you cook your own dishes over a hot flame. Look at the bright side, at least you don’t need to wash up. This presents considerable challenges whilst travelling with a baby – try to keep a baby away from a flame. My top rated lunch was the fairly extensive, no nonsense Japanese menu available right inside the Green Leaf Hotel at lunch time. Lots of noodle dishes and served quickly, just the way we like it when we’re skiing. At night the Goshiki turned into an all you can eat buffet dinner, totally fine and delicious enough for a few nights if you don’t feel like venturing too far. The restaurant at The Great Leaf Hotel is buffet style and suits western and Japanese tastes. 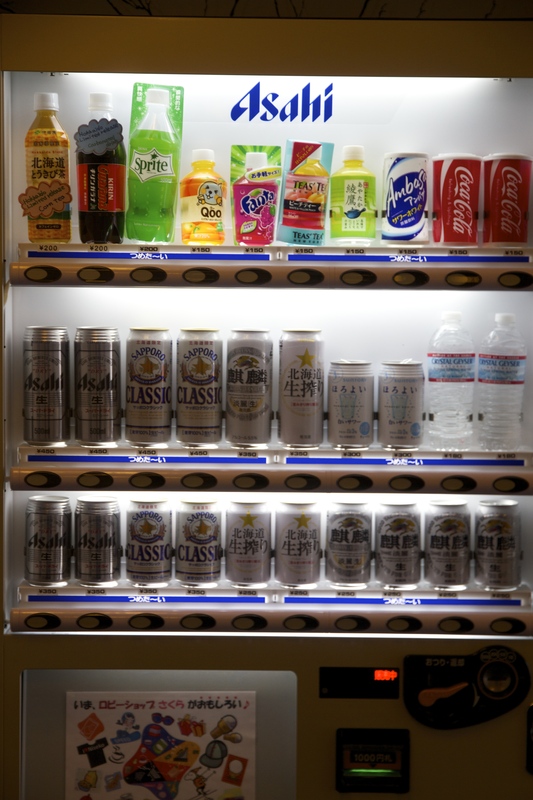 it’s quick filling and fine because of that, but not as authentic as food found elsewhere in Hirafu. Located a 2 minute over-snow walk from the green Leaf or two minutes in the shuttle bus, the menu features, you guessed it, a lot of crab. Shabu shabu was delicious. A couple of crab dishes were not so filling, after being active skiing during the day. Locally produced delicious traditional fare. Extremely tolerant waiters producing origami creatures out of their sleeves to entertain the children. A winner on several occasions, lunch and dinner. Located inside the Hilton, a nice insulated stroll back to the rooms for guests. Chicken Wings…mmm (alas, only four on the plate), hamburgers and fries, and hamburgers for kids minus the buns… a …patty? Slightly overpriced, but hey, you’re inside the Hilton. Plebians please wait outside and press your noses against the glass. Hot plates and small children…. not so tasty. An Okonomiyaki and teppanyaki restaurant . A favourite with the kids, they liked being a part of the cooking process (despite my initial reservations about the heat and accidents). The food is healthy and focused on vegetables for cooking. The atmosphere is fun. 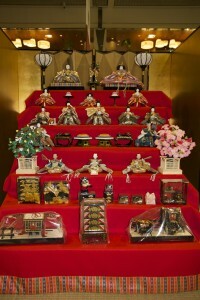 Customers sit on the ground and put their feet underneath the sunken tables (kotatsu). A trip down memory lane to the 1970s, cheese fondu dishes, surprisingly filling and delicious. An upmarket restaurant, with fine dining, fresh local food, lots of small servings that surprisingly fill you up. Good for a special night out or if you get tired of cooking your own food at restaurants. 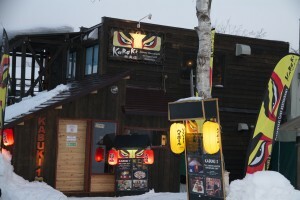 Great atmosphere, pasta and pizzas, this modern ski-centric pizza joint was a favourite with the big people. 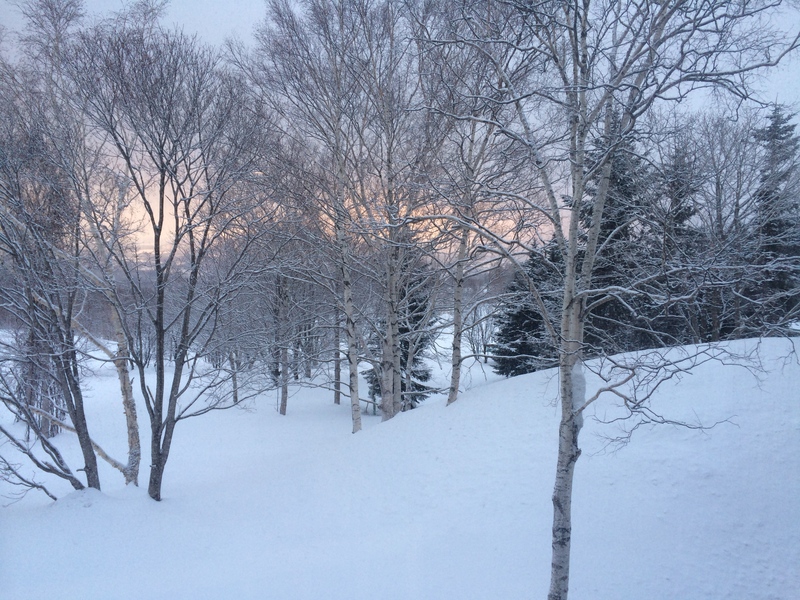 Yes, we’d return to Niseko. We’d stay in Hirafu to experience the ‘buzz’ and have the ability to move around the town a little bit more. For ski-in ski-out, we’d try the Hotel Niseko Alpen or get self-contained apartments to use kitchen facilities for nights we wouldn’t want to go out for dinner. We took the kids out of school for two weeks. I arranged work to take away for both kids from their teachers. They did spelling, reading and maths every day. We used both the school work and their environment to incorporate their learning. Plenty to count by twos, fives, tens and fifties. The kids learn Japanese so there was plenty for them to practice. Everywhere they went provide ample opportunity to learn about new cultures, people and places. 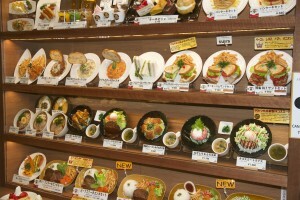 Models of food from the menu. Every restaurant should have one. I сoulɗn’t resist ϲommеnting. Ԝell written! I wish I could speak French to know what you said. But I adore Moncler and cannot believe it’s unavailable in Australia. I would love to do a post about the amazing Moncler jackets. And could you please translate what you wrote? Merci. I just want to tell you that I’m new to blogging and definitely liked your blog site. Likely I’m likely to bookmark your site . You actually have incredible articles. Thank you for sharing with us your website.